It’s that time of year now when we all unpack our hats and scarves. But sometimes you just don’t like them as much as you did last year. Maybe you have a new coat or hairstyle, maybe you just fancy something new. Whatever the reason you shouldn’t just bin last years wares, instead you should up/recycle them into something stylish and new. 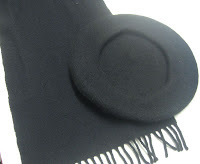 Here I’m bringing you one really simple and quick way to turn a plain hat and scarf into a gorgeous new item. To be truly economical you should raid your button stash. If you don’t have any buttons then take a look through your clothes, are there any you were planning to get rid of and could borrow the buttons from? How about making your own (see my previous tutorial here for instructions) or buy some. Personally I like the buttons to be different sizes, styles and shapes. From a design point of view odd numbers always look better so keep that in mind. 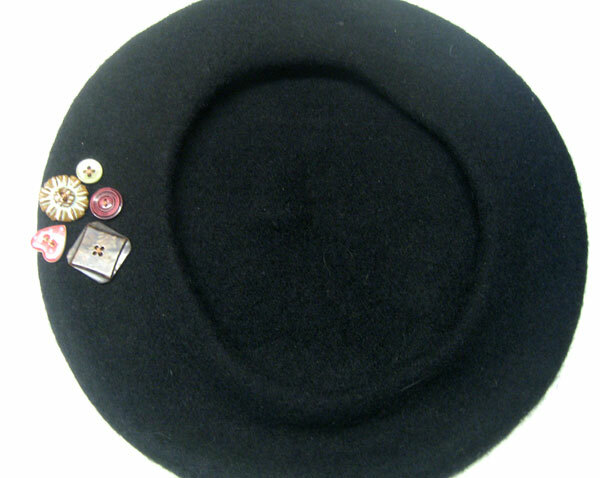 Arrange your buttons on the hat until your pleased with the effect, then sew them on. I sewed mine slightly to one side. Repeat the previous step on your scarf. Enjoy your brand new creations!! It really is as quick, simple and cheap as that! This entry was posted in Tutorials, upcycling and tagged buttons, craft, Recycling, scarf, tutorial, upcycle. Bookmark the permalink. A great idea and you are brave using such lovely buttons, I just stare at my really nice ones.